According to my dog-eared 1971 copy of Dictionary of Biology, parasitism is “a form of symbiosis in which two organisms live in close association with each other, the one, a parasite, depending upon the other, the host, for some essential food factor.” Though quaintly simple and written with too many commas, this conveys a basic concept – one individual is taking resources from another. And on the sun-dappled slopes of Sobrante Ridge, our parasitism parody is playing out. Two native western plants are struggling for survival. One of them is struggling decidedly less than the other. Arctostaphylos pallida in bloom, dangling urn-shaped flowers that will mature into "bear-berries." The main threat to its existence is decades of fire suppression – without fire, this particular manzanita species has a hard time reproducing. Unlike its burl-forming relatives, A. pallida cannot propagate itself through sprouting. This leaves only the traditional method of seeding for regeneration, and pallid manzanita likes it hot. Fire-scorched hot, in fact – the seeds require fire scarification to germinate, and prefer to sprout in fire-sterilized soils, free from competing plants, allelopathic leaf litter from their parents, and potential fungal infections. 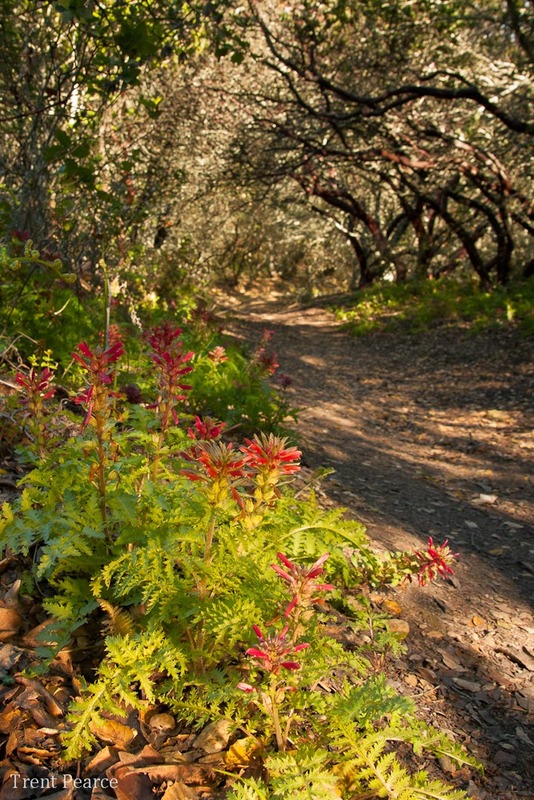 It is estimated that without a regular fire regime to control undergrowth and promote seedlings, A. pallida will be outcompeted by native understory plants after approximately fifty years – and the population at Sobrante Ridge has gone over 100 years without a fire. 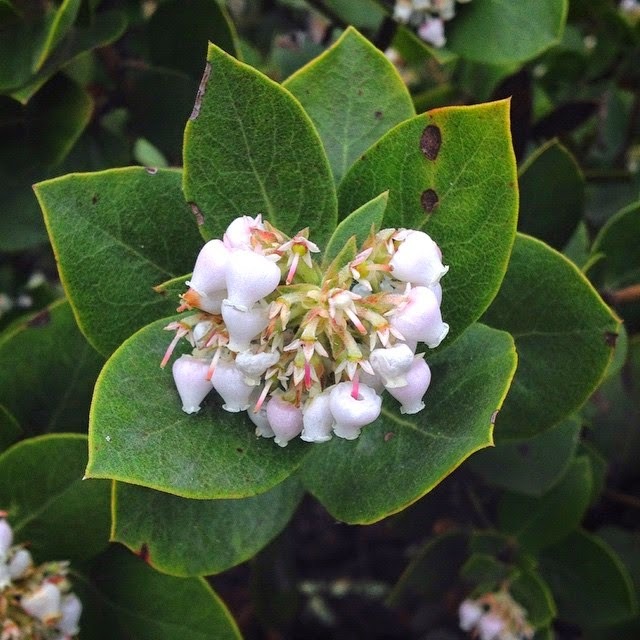 Yet to stroll the shady paths of the Manzanita Loop Trail, you would think this plant is doing well – over 2,000 individuals were once counted here. Accompanying the maroon trunks on this breezy February afternoon are an abundance of crimson flower spikes, originating from a basal rosette of fern-like leaves. 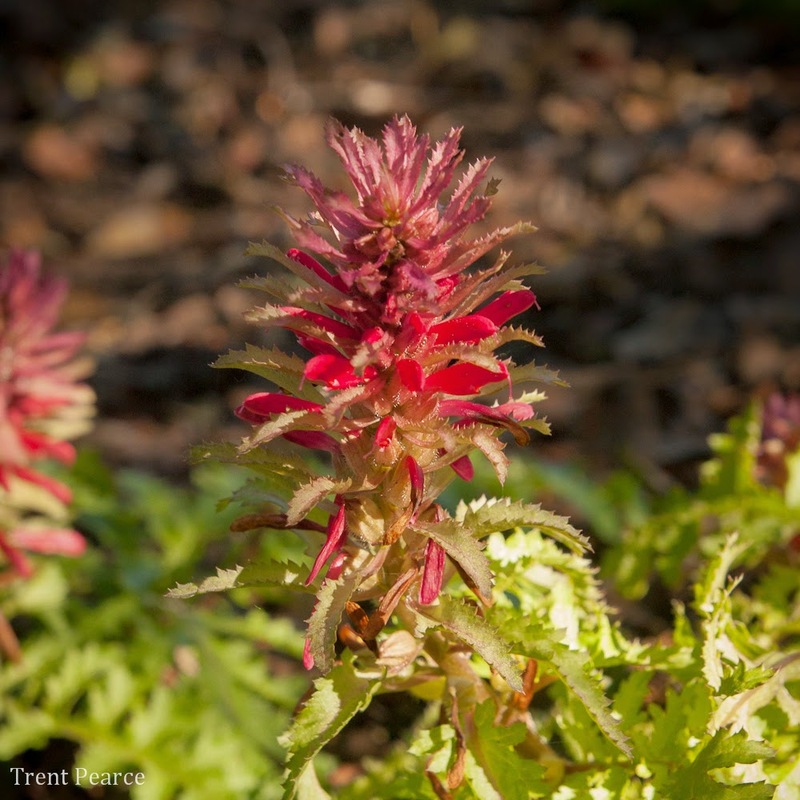 Indian warrior (Pedicularis densiflora) is an early bloomer, and is particularly prolific this year at Sobrante Ridge. 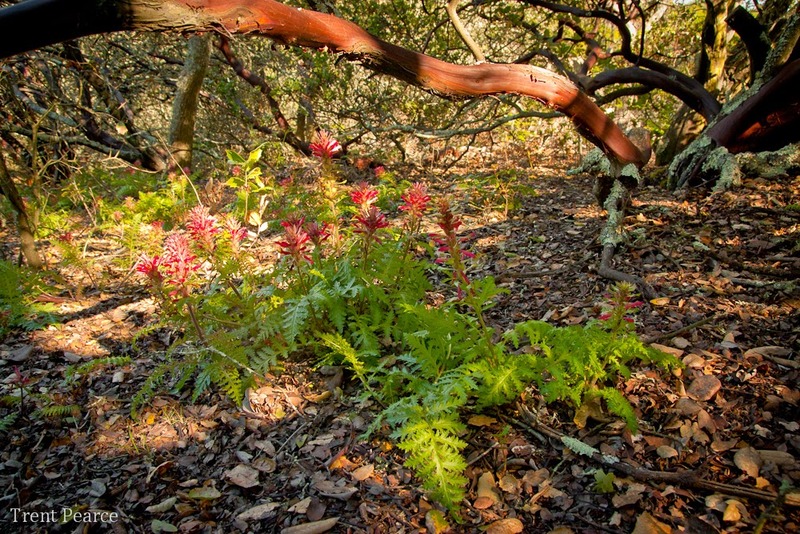 But digging in to this plant would literally expose something odd – roots that are connected to those of the nearby manzanitas. Barring excavation of endangered plant habitat (never a great idea), we can glean these facts simply by knowing the flower’s family – it is an Orobanchaceae, and comes from a long line of thieves. The “Orobanchs” are legendary for their parasitic lifestyles – of the more than 2,000 species in the family, only 18 entirely provide for themselves. The rest rely on other plants for either some or all of their water and nutritional needs, growing a special type of root called a haustoria to tap into their host plant’s vascular system. And our little-footed friend P. densiflora is no expection. But why, if the plant relies on another for nutrition, the green leaves? Plants in the genus Pedicularis are hemiparasites, meaning they aren’t complete freeloaders. They possess chlorophyll and are capable of photosynthesis, and will grow on their own if they can’t find a nearby host (known as facultative parasitism). 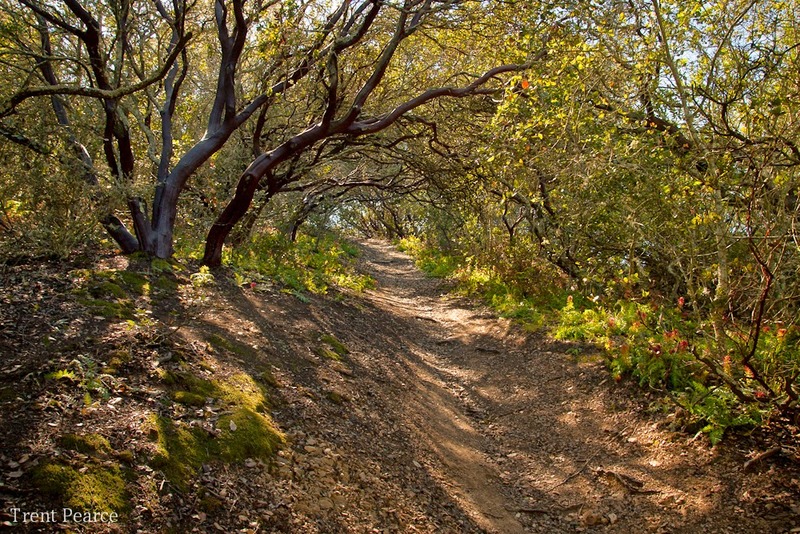 But for the plants at Sobrante Ridge, a host isn’t far away – they find supplemental nutrients from the ancient pallid manzanitas under which they grow. Pushing their haustoria into the manzanita roots, they form a xylem bridge – a direct connection to the host’s vascular system. Then, boosted by the additional sugars produced by the host’s canopy, P. densiflora can burst forth with massive spring blooms unequaled by their gaunt, non-parasitic neighbors. If there is an upshot to this ghastly tale of carbohydrate thievery, it is that the Indian warriors aren’t killing the pallid manzanita. That strategy, known as parasitoidy, would not benefit future generations of Pedicularis, for they would have to spread and find new hosts on which to grow. That’s a lot of work for a perennial plant that could instead come back in the same place, with the same host, year after year. But for the tired old manzanitas, Pedicularis' parasitism is one more tax to pay on their ever-increasing cost of living. If you make it to Sobrante Ridge in the next week or so, and admire those abundant stands of crimson flowers, know that something else is paying the price for that splendor. After a fleeting glimpse of my lifer cuckoo wasp last summer near Sierra Valley, I have spent countless fitful nights longing to gaze at that slender, metallic body once again. One might imagine my sheer delight when, last week, a second grade student on an insect hunt approached with said muse packaged neatly in a small plastic box. Before he could say “Look what I found!” I ripped the container out of his hands and begin preparing my soliloquy on the importance of sharing scientific discoveries. He kindly acquiesced to allowing me to keep the insect temporarily for study. Upon arriving at the lair of natural history, I pulled the delicate package out of my pocket only to find the beloved critter curled into the familiar insect death pose. “Damn my careless self!” I thought, and stormed off to make a cup of Earl Grey and pontificate my murderous tendencies. After tea and musing, I returned to find the corpse actively crawling about and vigorously shaking its antennae; upon which I promptly fainted on the nearest fainting couch. It turns out that a universal trait of members of the Chrysidinae sub-family is the ability to conglobulate - curling tightly into a protective ball, tucking the head against the abdomen and essentially playing dead. Not only was the wasp still alive, but its identity had been narrowed down to one of a scant 19 genera. Of the 227 chrysidid species in North America, 166 occur in California and around 22 are endemic to the Golden State. With such cuckoo diversity, why then had I not found dozens of these small wasps over the course of my naturalizing career and instead resorted to stealing one from a relatively helpless child? It has to do with their life history and unique habits of reproduction, which also earned them their common name. Mind raising my kid for me? Also my kid is going to eat yours. Thanks. Like their avian namesake, cuckoo wasps are nest parasites. Most genera are parasitic on other Hymenoptera , specifically solitary bees and non-social wasps. The female cuckoo wasp sneaks into the nest of her host and lays an egg, either in a larval cell or directly on the larvae or pupae. Then the cuckoo wasp larvae hatches and eats either the food provided to the host larvae (cleptoparasitism) or the host larvae itself (parasitism). The larval cuckoo wasp then pupates and flies out of the nest unscathed as an adult. As a product of this lifestyle, adult female wasps are most commonly found crawling rapidly along the ground, under plants and on decaying wood where they might encounter a host nest. And that neat conglobulation trick? When you’re entering the nest of a well-armed stinging insect, it helps to have good armor. When rolled into a ball, cuckoo wasps are almost impervious to host attacks and are often carried out of the nest by the defending female - only to stage another siege. Pits in the exoskeleton provide protection and the brilliant color. While I can personally admire this unique take on parental care, I’m afraid many of you may scoff at such a lifestyle and write off cuckoo wasps as worthless freeloading parents. Fortunately, they are also incredibly beautiful – most species in California are a brilliant metallic green or blue. This is due to the diffraction of light upon their multi-layered and heavily pitted exoskeleton, which provides additional protection from stings and bites of host adults. More good news: chrysidid stings have evolved back to their intended use: an egg-laying tube with a reduced poison gland, meaning they have lost the ability to sting. They're stunningly beautiful, have the best parental strategy since Al Bundy, and can't sting. If after absorbing this fascinating life history you find yourself completely enamored, get outside and start looking on the ground. In California most adult cuckoo wasps are active between May and August, where they can be found nectaring on flowers or crawling about searching for host nests. And if you’re looking for something to write your entomological thesis on (and aren’t we all at heart)? In her definitive tome on the subject, Lynn Kimsey tells us that only 10% of North American chrysidids have an identified host species. The possibilities are limitless. I recommend using children to find your specimens. Do we need to vilify animals in order to explain natural predator-prey dynamics and dispersal behavior? From the tone of a recent snippet by SF Chronicle writer Tom Stienstra, it would seem so. 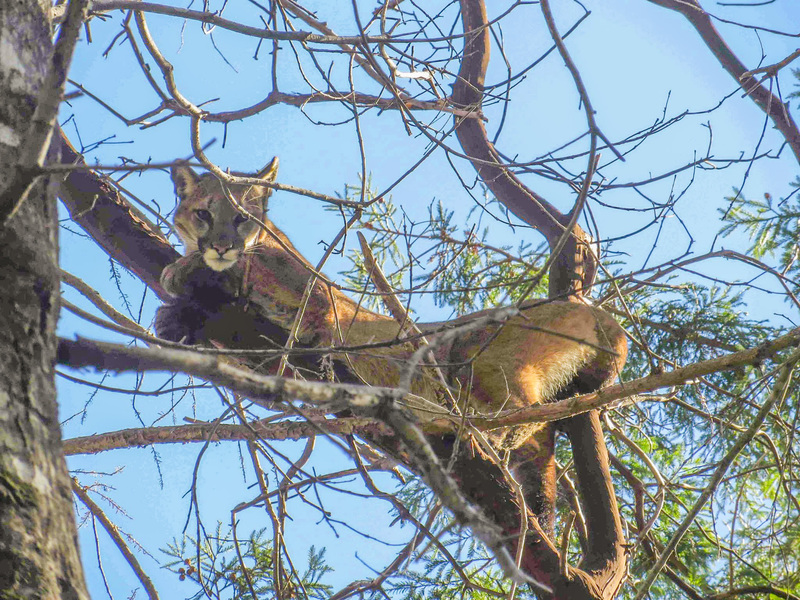 His rather sensationalistic piece was written as a belated follow-up to the dramatic story of puma 46M's recent trip to Mountain View, which thankfully ended with the cat being safely tranquilized and relocated to the Santa Cruz Mountains by the UCSC Puma Project. 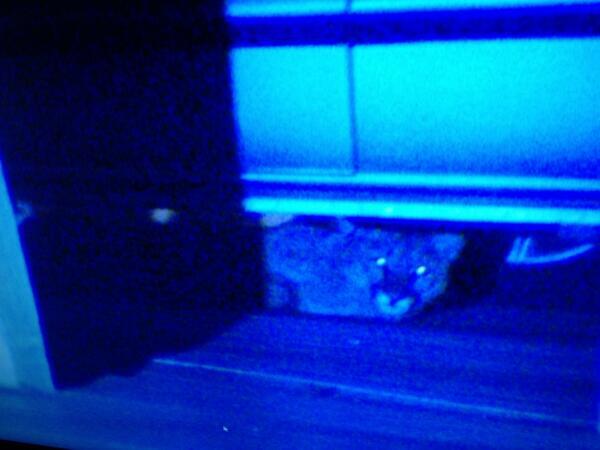 Puma 46M under a car in a parking garage. From UCSC Puma Project. Pumas aren’t wiping out California’s deer population; on the contrary they are bringing it into check, providing a natural control that other parts of the nation (such as the deer-ravaged Midwest) could desperately use. Furthermore, the author fails to address the basic ecological principle that as prey populations are reduced, predator species will decline as well – if there are fewer deer, there will be fewer puma births. Unfortunately, natural systems don’t always agree with anthropocentric interests, such as managing prey species for hunting (black-tailed deer) or preserving a species pushed to the brink of extinction by resource extraction (fisher). The question for us, then, is how we will respond to these wild systems when they don’t necessarily agree 100% with our interests. How will humans respond to increasing interactions with large animals such as pumas as we push into their territory? From UCSC Puma Project. What Mr. Stienstra might have said was as HUMAN populations continue to expand and disperse, we are more and more likely to encounter natural systems at work, such as the young male puma in Mountain View who was fortunate enough to be contained by police and wildlife biologists – unlike many pumas who die at the hands of landowners or, worse yet, on the bumper of an automobile. What will the lions eat next? The same things they have always eaten when deer aren’t available – smaller mammals such as raccoons and various rodents. And perhaps sensational journalists.